I read somewhere that the annual celebration is mostly about pounding beer as long as you can stay upright. 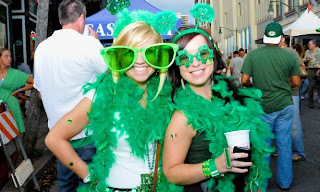 Partiers will revel 'til the wee hours of the morning over their heritage, adopted or true, then stumble home (designated driver at the helm, please) their green boas and goofy glasses still partially intact. But will they remember you come morning? 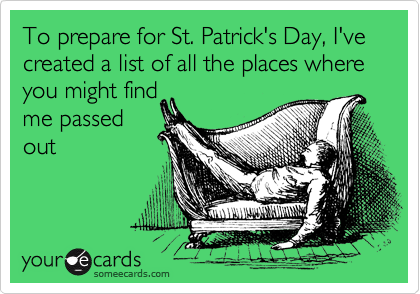 For those of us in the business of marketing establishments that sell Guinness, Bushmills and even green beer, St. Patrick's Day is a true pot of gold. If you're not being proactive you could end up with Leprechaun gold – fools gold or vanishing gold. Call it what you want if you're a one day hit wonder you're wasting a golden opportunity. St. Patrick's Day is a business opportunity. Let me say that again, St. Patrick's Day is a golden business opportunity! It is not just a day to rake in the reveler's cash at the tap. Meaning – if you're going to throw the party make sure you're remembered, or should I say retweeted. It's time to get out your green thumbs, and I don't mean the one's that plant flowers. It's time to be social about it - text, tweet, tag, pin and post. The idea is to get everyone talking before and after. Create a buzz! (pun intended) It's just common sense that the longer they're talking about you the better they'll remember you. And let's not forget, in this digital age, they'll tell 20 friends (especially if they're in the photo) and they'll tell 20 friends and 100's, 1000's even, will hear about you. A word of caution: If you're not tweeting, pinning and posting, someone else is bound to be. So then the question is, Who's going to be in control of what's spread about you? Is it the guy with the photo of his friend the town idiot who just happened to make a fool of himself at your bar? Or will it be you with great posts of the nights highlights – your great food and beverage concoctions, photo's of your happy customers, the festivities and decor, recipes, giveaways and more? - here's to your pot of gold going viral!